Rescue a gnomish community in their giant tree stump home from an invasion of duergar in this highly thematic 3rd level adventure. 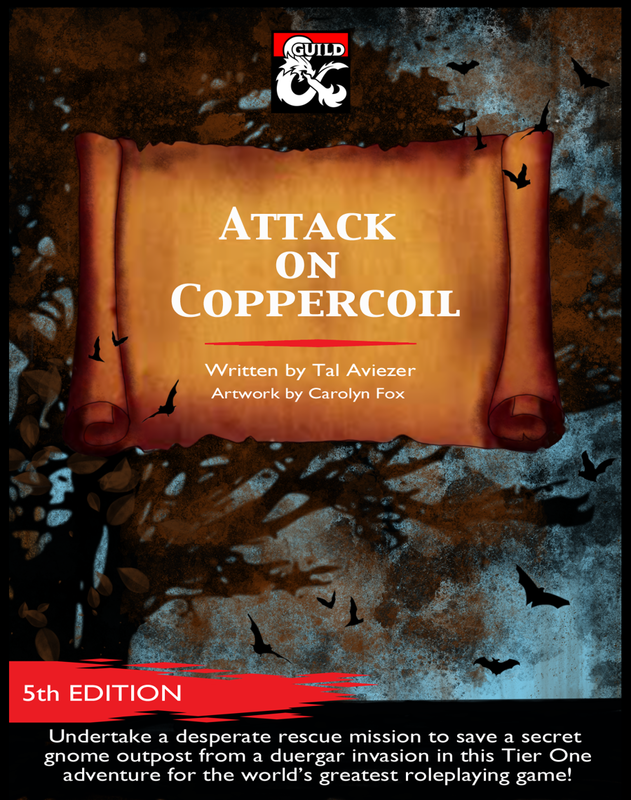 A review copy of “Attack on Coppercoil” was provided by the publisher. Find more DMs Guild Reviews on my website and YouTube channel. Gnomes are probably the most overlooked race in Dungeons & Dragons, and no I’m not trying to make a size joke. They’re often portrayed as an in-between combination of the pragmatic, stoic dwarves and free-wheeling halflings. Are they nature-loving hippies or industrious artificers? No one race should boil down to any single profession or trait, but it makes gnomes a bit trickier to pin down, and I don’t see them used very often in adventures. Enter “Attack on Coppercoil,” which satisfies my gnome curiosity. The titular community, which resides inside a massive hollowed-out tree stump in a forest, is under attack by a sudden raiding party of Duergar who have tunneled up from underneath, and it’s up to the PCs to rescue them. It’s designed for a party around 3rd level, with adjustments for levels 1-4, and should take about one or two sessions. What makes this relatively straight-forward adventure so compelling is the excellent use of environmental storytelling. The entrance has dead gnomes with crossbow bolts in their backs. The druid’s home, a birthday party, and a bat “hibernaculum” have been ransacked, while duergar are still trying to get into the magically locked door of the scriptorium. A giant snail lie butchered and bleeding at the stables, while another cowers in its stall. Numerous notes and drawings make reference to a friendly octopus named Silas who lives in the fountain, while a construct defends his master’s home while repeating his dying words over and over again. All of these elements help tell the sad story of this community’s immediate plight. Eventually the PCs meet the one non-captured, non-slain gnomish resident (the young birthday girl) who can fill in the rest of the details. A duergar raiding party had tunneled up and attacked without warning, using a giant spider to smash down doors and capture the poor residents. The duergar aren’t interested in wholesale slaughter, however, but in capturing gnomes to take back and enslave. The party has a chance to rescue everyone in a final boss battle against the duergar leader. There may be some interesting dilemmas if the party had looted any of the gnome’s belongings – they’ll want them back! Though they are willing to pass out some rewards as well. As much as I like the well-detailed map, it’s not without flaws. For some reason the stump is enormous (over 250 feet across!) and thus the entire area feels oddly empty. The buildings and areas themselves are packed with things to interact with, but the spaces between are extremely empty. A zipline between elevated buildings is awesome, but it would have been just as cool 50 feet long as opposed to over 100 feet long. 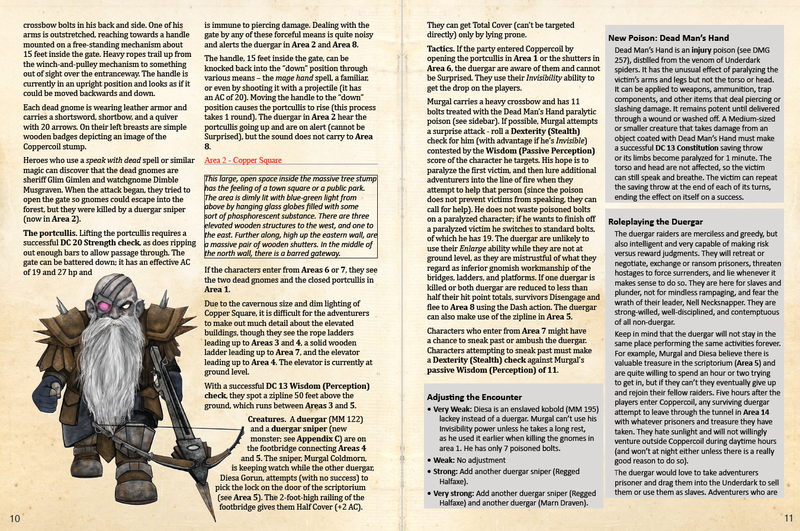 The appendix includes notes on a few unique creature statblocks, items, and as well as several quality player handouts. There’s also a fully fleshed out optional variant that adds a party of evil adventurers who also come calling. Since Coppercoil sent out a bunch of SOS message in the hopes of rescue, it makes sense that one of those may have fallen into the wrong hands. Balasar’s Bashers are the classic antagonistic adventurers. They show up ready to loot the place and only engage in enemies if there’s profit involved. Used well they could enhance the entire adventure, adding a rogue element of danger at just the right moment. Coppercoil comes alive through environmental storytelling in each area, from an insidiously trapped letter to an interrupted birthday party. Everything you need on a single map, with full color and black and white options. Fun elements and options for PCs – including a friendly octopus, tamable giant snail, defensive construct, and alarm-blaring trap door. Several full page player handouts to draw the PCs into the town’s history and current plight. Optional evil party of adventurers that can throw a deliciously evil wrench into the PCs’ plans at any time. The map needs height elevation markers in the southern area. The map feels overly big, and as a result a bit empty. The Verdict: “Attack on Coppercoil’s” Superb environmental storytelling make this low-level rescue mission into a giant tree stump memorable and compelling.